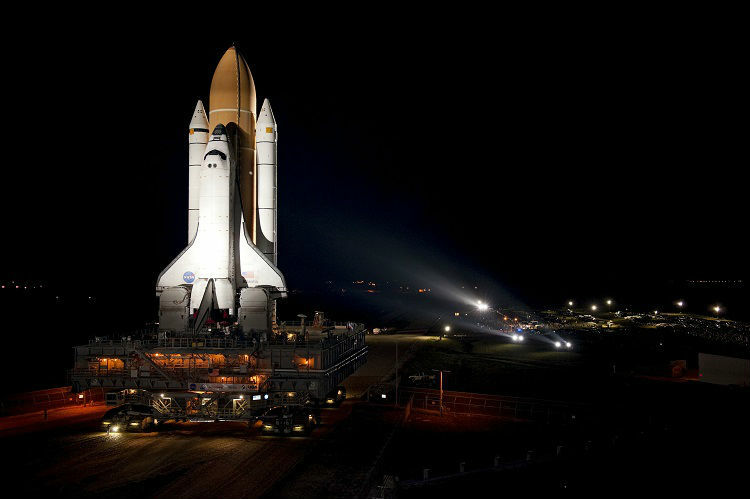 It's been five years since the last Space Shuttle mission took place. And let me just start by saying that nobody actually loved the Space Shuttle itself—they just loved the idea of what the Space Shuttle appeared to represent. To a generation that had recently witnessed the Apollo Moon landings, a winged space-plane looked more like something out of a futuristic Science Fiction film rather than something that could exist alongside Disco and Hair Metal. 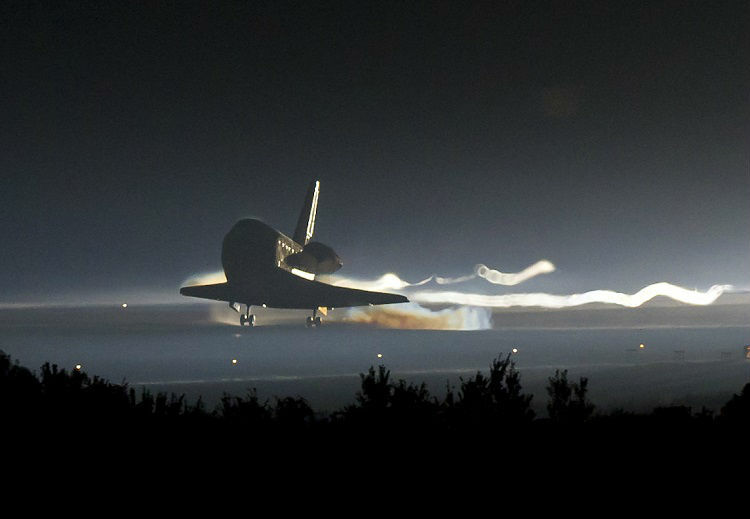 STS-135 Atlantis touches down for the last time. Image: NASA. But the Space Shuttle wasn't all it was cracked up to be—the cramped interior didn't match the impressive exterior at all. The Shuttle had no 'bridge' like the one on Star Trek, no elegant crew quarters (they basically camped out in floating sleeping bags), no mess hall or sickbay filled with magical gadgets, and no artificial gravity. Instead, astronauts relied on basic first aid procedures and consumed dehydrated foods while awkwardly floating around in micro-gravity. And they still do. Life in Low-Earth Orbit remains the very definition of Spartan living conditions. Also, despite being an impressive feat of engineering, the Space Shuttle was, in many ways, far less capable than the more straightforward and refined Apollo capsule that took the first humans to the Moon and back. Unless your definition of 'capability' is messing around in LEO for thirty years without ever sending a crew out into deep space... Then in that case, yes, the Space Shuttles were very capable machines. But to be fair, the Space Shuttle was never designed to fly to Mars or the Moon. It was designed to stay in LEO, never going further than a few hundred kilometers/miles away from Earth's surface. It's like living in a bathroom stall... in space. Image: NASA. Today, 47 years after Apollo 11 landed on the Moon, we've had the continuously crewedInternational Space Station (ISS) in LEO for nearly 16 years—thanks in large part to the Space Shuttle. And still, nearly half a century after Neil Armstrong took that small step out onto the Lunar surface for the first time, we don't yet have humans traveling to Mars, or back to the Moon, or even out beyond Earth orbit. Is that a legacy worth celebrating? I certainly don't think so. And although the Space Shuttle was a cool machine for its time, it should never have stayed on as the flagship spacecraft at NASA. The Shuttle is a workhorse that was designed to shuttle things between Earth's surface and LEO. And that's what it did. And that's what we did. And while it did that, human beings stopped reaching. We stopped pushing the frontier. 1. Begin developing the next-generation of hardware that will take humans to Mars. 2. Update existing Apollo architecture and build a manned Lunar outpost. 3. Design a new type of launch vehicle—the Space Shuttle—that can aid in the construction of a space station in Low-Earth Orbit. Option #1 would have been the most logical next step... That is, assuming NASA would be able to secure a significant increase in its Apollo-era budget. The Mars plan would have required rockets even more powerful than the Saturn V (which remains, to this day, the most powerful rocket ever built) and an entirely new type of in-space propulsion system (which has yet to be developed to this day). 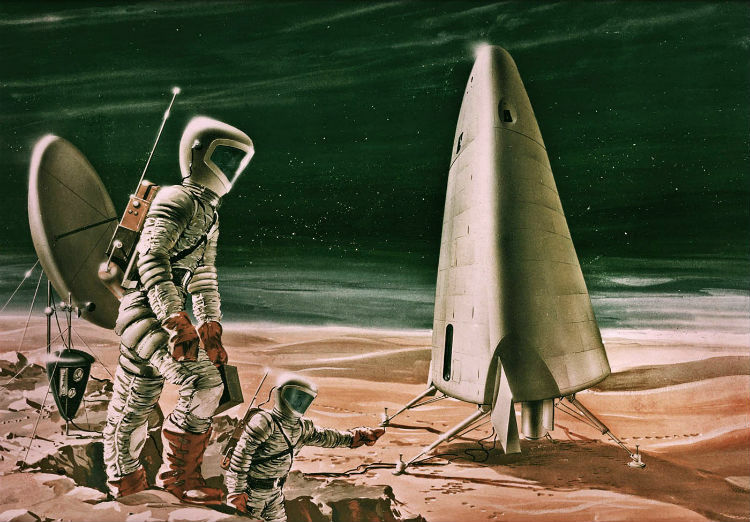 Artist's concept of a Mars mission in 1963. As if, NASA. Image: NASA/Aeronutronic Divison of Philco Corp. In the end, a 1970's mission to Mars would have been prohibitively expensive and technologically unfeasible. NASA had already commanded nearly 5% of the United States' total federal spending budget in order to get to the Moon, and Mars would have required a lot more. Option #2 was an equally logical step to Option #1. NASA was light-years ahead of the Soviets in their own mission to the Moon, and establishing a Lunar base would have allowed the United States to maintain a strong lead on deep space exploration for the foreseeable future. But remember: the Cold War was in full swing during the 1970's post-Apollo era. The U.S. and U.S.S.R. were building bigger nuclear weapons and better ballistic missiles with which to deliver them. There was also the looming threat of weaponization of space. 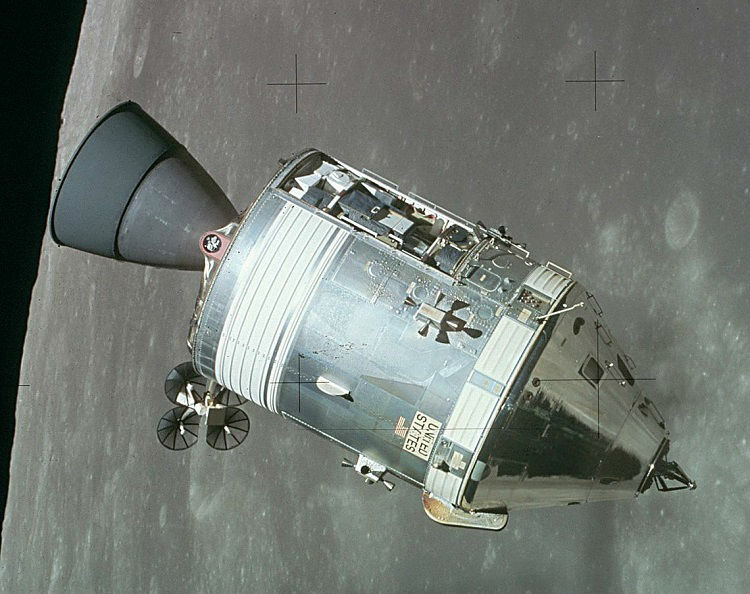 WithApollo winding down, the time for exploration had passed—the Moon no longer held any strategic value, nor did space exploration in general. This left NASA with Option #3. The original plan was to develop the Space Shuttle and a space station simultaneously, a program that would allow NASA to maintain a continuous human presence in orbit and which would align with the United States' national defense strategy at the time. Just as the U.S. Air Force maintained the continuous threat of bombers in the sky ready to unleash hellfire on the Soviet Union, so too would NASA maintain a constant presence in Low-Earth Orbit—ready to intervene if the Soviets tried to stockpile nukes in orbit. Artist's representation of STS-1 Columbia landing in 1982. Image: Robert McCall. Following Apollo, NASA engineers became inevitably audacious in their perception of what was practical. Landing humans on the Moon and returning them safely to Earth had seemed really, really hard. But they did it. Landing a biological research lab on the surface of another planet also seemed really hard. But they did that too. Having a winged spacecraft launch into space, then re-enter the atmosphere and land on a runway like an airplane also seemed pretty darn hard—but for less obvious reasons. Atmospheric re-entry requires great precision. If you come in too steep, you'll plunge deep into the atmosphere too quickly. Slamming into the thicker lower atmosphere at spaceflight-velocity is like an airplane slamming into the ocean at full-throttle—not good. But if your angle is too shallow, your spacecraft's heat shield won't be able to use the atmosphere to slow down and you'll end up exiting the upper atmosphere back into orbit—sort of the equivalent of an airplane not touching down soon enough and skidding off the runway. A professional illustration of how not to re-enter Earth's atmosphere. Image: Dan Levesque. In order to stick the atmospheric re-entry, the spacecraft needs to be aligned just right. And that's easy enough to do on a spherical-shaped heat shield, like Apollo's (and every other spacecraft that's ever returned to land on Earth). Adding wings to the thing just adds to the complexity, as aerodynamic forces are exerted across the vehicle unevenly. Plus, the heat shield has to be durable enough that the landing gear still works after being partially burnt up in the Earth's atmosphere. Basically, having a spacecraft that's also an airplane is sort of like having an airplane also be a submarine. It's not physically impossible, it's just that... Why do we need that? The Space Shuttle ultimately proved difficult to master; two disasters claimed the lives of 14 astronauts and led to the complete destruction of 2 out of 5 total Shuttles—first Challenger in 1986, then Columbia in 2003. Both of these tragedies can be traced back to the faulty logic of having a 'reusable' winged spacecraft mounted to the side of a giant tank of rocket fuel straddled by two independent rocket boosters. In the end, the Space Shuttle turned out to be the deadliest spacecraft ever flown. If a commercial airplane had the same safety record, nobody would fly on it. STS-135 Atlantis before launch in 2011. Image: NASA. With budget cuts, cost overruns, Shuttle problems, and delays in space station development, NASA was unable to allocate the resources required to develop a new deep-space capsule. In the meantime, we sent robots out to explore the cosmos in place of astronauts—all while the astronauts played housekeeper on board the fashionably late International Space Station (ISS). The Space Shuttle was never intended to be a replacement for Apollo. And NASA's forthcoming Orion capsule and SLS rocket will not be a replacement for the Space Shuttle—it's more a spiritual successor to Apollo. The Orion spacecraft will enable the return to deep-space exploration that ended with 1972'sApollo 17 mission to the Moon. If NASA remains on schedule, human beings should be traveling out into deep space in 2023—still more than 40 years after the crew of the finalApollo mission had done so, but at least we're getting back out there. 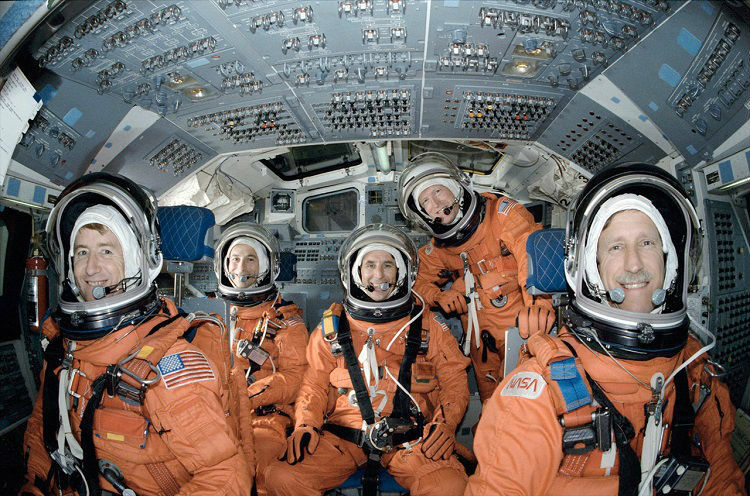 The Space Shuttle wasn't a happy story. It was intended to make the space frontier more accessible than ever before, but it ultimately led to humanity being stranded in Low-Earth Orbit for decades. In a strange twist of fate, without any operational spacecraft of any kind, NASA has had to rely on the Russian Soyuz capsule (originally developed in the 1960's by the Soviet Union) to take its astronauts to and from the ISS for the past five years now that the Shuttle is officially retired. But it's not all NASA's fault. Apollo wasn't a natural progression into space anyways—it was a far reach that cost an insane amount of money to achieve. A Moonshot. A risk that could just have just as easily resulted in catastrophic failure (and almost did during Apollo 13). That risk pushed humanity to the Moon 47 years ago, and since NASA's funding dried up post-Apollo, we haven't been back since. The simple elegance of the Apollo Command Module. Image: NASA. It's a strange phenomena, because every other place that human beings have explored has eventually become inhabited. That's how it went with the Americas. We even have year-round bases operating at the South Pole. That once-treacherous journey to North America has become so commonplace that nearly anybody on the planet can afford to do so—and not on a risky multi-week journey as had previously been the norm, as it's now possible to zip across the Atlantic in a winged metallic tube in just a few hours. This too is our destiny with the stars. We probably would've been destined to go to the Moon sometime in the 1990's (give or take a decade) had the Cold War space race not existed. And it probably would've been a lot easier to build up to that rather than using 1960's technology... Instead, we just threw money at the problem and flew to the Moon. An analogy would be if the King of some European country had contracted a team of the brightest scientists of the late-1800's to build a flying machine capable of crossing the Atlantic ocean. With enough capital, such a feat probably could have been accomplished decades before it eventually was, perhaps even earlier than the Wright brothers' first flight. And that accomplishment may very well have gone the way of Apollo—been prohibitively expensive, not viewed as practical, never attempted again, the surviving flying machine ending up in a museum for some decades until it could eventually be replicated by private industry (ie. SpaceX). Some may even have questioned whether or not that legendary 19th Century flight across the Atlantic could ever have occurred at all, or if it had all been faked as part of some sadistic propaganda campaign/cover-up during the waning years of European Colonialism. Our space age could have started off a lot differently. But here we are. And there will come a point in human history where we'll be zipping through space to the Moon or Mars just as easily as we zip across the globe today. The inevitability of it is just a matter of human ambition and time—and while the former may be lacking at the moment, the latter is infinite.